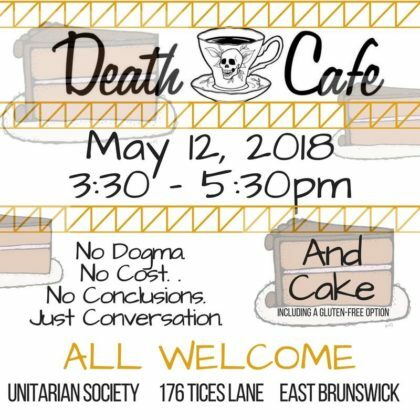 Spend your Saturday afternoon with coffee, cake & conversation in small groups exploring our inevitable mortality and the topic of death. (Gluten-free option will be available) No dogma. No answers. No conclusions. But space for questions, queries, and speculation. The Unitarian Society is pleased to sponsor this event. It is open it to all regardless of religious affiliation or non-affiliation. This will be our last one unless someone steps forward to coordinate.